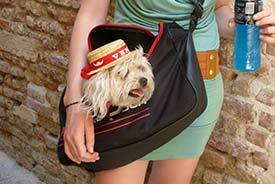 ABOVE: If you're worried about getting lost, bring a dog to help you sniff out the sights. What's the best sightseeing strategy for Venice? Take a long walk. Let yourself get lost. Why? Because Venice's biggest sightseeing attraction is Venice itself. Venezia is a remarkable city that was built almost entirely on a chain of 118 islands, using millions of wooden pilings (harvested from forests on the mainland) to support buildings that mostly date from the 1300s through the 1700s. Venice's street plan is complicated, confusing, and delightful, with a surprise around every corner. Don't get us wrong: You'll also want to allow time for a handful of "must-see" tourist attractions such as the Piazza San Marco, St. Mark's Basilica, and the Rialto Bridge. Visits to the Doge's Palace and a museum or two should also be on your agenda if you're in Venice for more than a few days. If you like churches (or even if you're indifferent), wander into a few churches like Santa Maria della Salute and some of our own favorites: Santa Maria dei Miracoli, Gianovanni e Paolo, San Giacomo dall'Orio, Madonna dell'Orto, and San Nicolò dei Mendicoli. Tip: Buy a Chorus Pass to save money on church visits. The Venetian Ghetto is also interesting. If you have time, you might want to consider a self-guided Venice islands tour by public transportation to Murano and other islands in the Venetian Lagoon. But for the most part, walking without a goal is the best way to enjoy Venice. What guided tours do you recommend? Unless you're pressed for time or have a limited capacity for walking, you don't need sightseeing tours. Just enjoy the remarkable urban landscape and see how Venetians live their everyday lives. Still, if you enjoy guided tours, you can pre-book tours through Viator or (more expensively) hire a private guide. See our Venice Tours page for suggestions with links. We also recommend the tours of Gran Teatro La Fenice (Venice's opera house), the Grand Canal palazzo headquarters of Ca' Foscari University, and the historic synagogues in the Ghetto). What's the best tour bargain in Venice? Any more tips about things to see and do?